@dianab my comment was answering KF comment about their relationship being a fairytale, it isn't. We all have seen their relationship playing out this last ten years and sometimes it hasn't been nice. Andrea and Tatiana leaving the hospital with baby. There's also pictures of Caroline. Baby was born in Portland Hospital for Women and Children, Great Portland Street in London, it appears on some of the pictures! Caroline, exclusive images after meeting her first grandchild. Andrea Casiraghi & his siblings Pierre and Charlotte, and their mother Caroline, and Alex Dellal (ex-boyfriend of Charlotte and friend of Tatiana - their brazilian mothers know each other for many years and then their kids are childhood friends), celebrate the birth of his son Sacha, outside the hospital! PS. The girlfriend of Alex is pregnant (I do think in last stage/months) of their 1rst child! Andrea, Tatiana, and Sacha leave the hospital after a visit. It is believed the new family is staying in Notting Hill, a few miles from Portland Hosital, and near Tatiana’s clothing store. 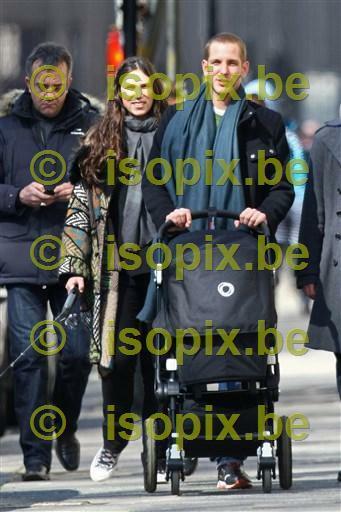 First Photos of Andrea Casiraghi & Tatiana Santo Domingo as parents. Oh do tell, tell me all the tawdry secrets! I missed this thread yesterday! Apparently the hospital gives you a celebratory champagne after giving birth. It's pretty swanky. And Andrea is looking rough! So when are they getting married? She usually spends her time flitting from yacht to island to glittering society ball. So when Princess Caroline of Monaco appeared in London today looking, well, normal, one would have been forgiven for walking right by the 56-year-old Royal. Princess Caroline was in town to visit her son Andrea, who last week became a father for the first time - making Princess Caroline a grandmother. thanks for all the things you post dianab!